When I moved to Logan Square, there were several restaurants on the landscape that looked inviting. I made plans to go to the restaurants and then I realized one day that eight years had passed … and I had not gone to several of the restaurants. Azucar Tapas & Cocktail Bar at 2647 N. Kedzie Avenue was one of the many eateries that I passed and never stopped in for a sampling. I corrected that recently. Having had a spell of hot and humid weather recently, Chicago experienced a reprieve from feeling tropical. 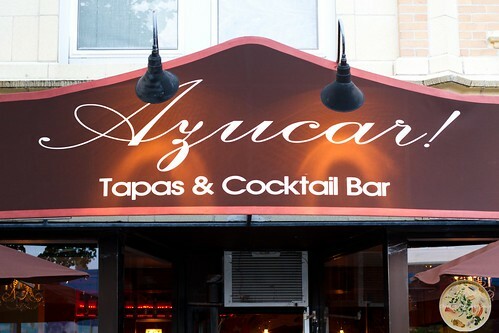 During my visit to Azucar, I sat outside to enjoy the nice breeze and a degustation of a few tapas items. 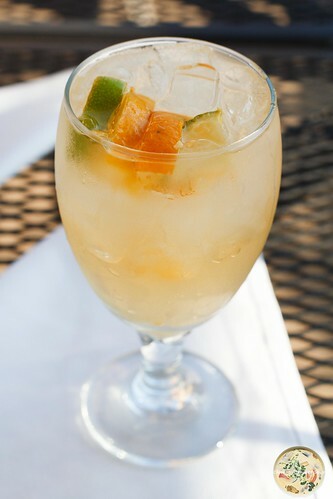 For a refresher, I started with a white peach sangria that was quite refreshing. While the alcohol was not heavy-handed, it was indeed there. To go with the sangria was olivos machacadas en casa, which was a selection of olives and baby pickles. The next course to arrive was a plate of empanadas pollos. These were tapas size empanadas, but they packed a huge flavour profile. They were not merely stuffed with shredded chicken, but they were stuffed with well-seasoned shredded chicken. 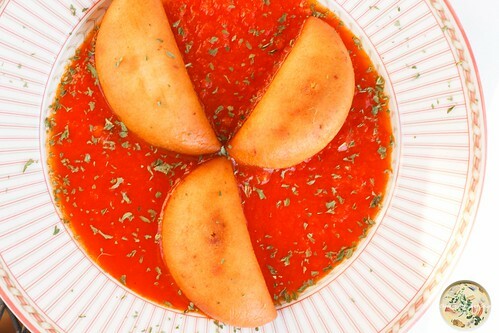 Served atop a tomato sauce and accented with basil, these were ideal with the finishing of the sangria. I then moved into a seafood option that was extremely tasty. 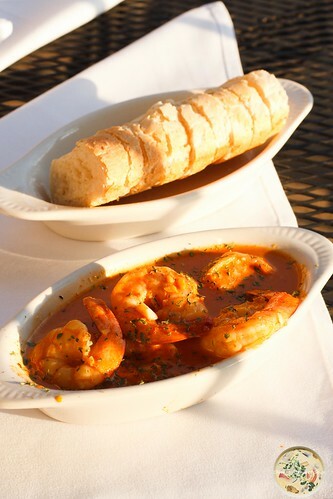 The gambas a pil-pil came as shrimp sautéed in spices and served in a dish that had a creamy garlic butter sauce. The perfect accompaniment with this dish was a mini loaf of bread that was ideal for sopping up the garlic butter sauce. 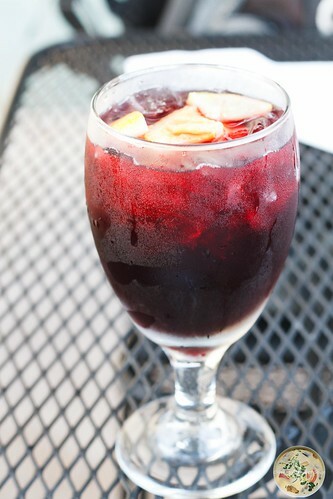 Also, with this dish, I had opted for a red raspberry sangria that was as refreshing as the white peach sangria and also mixed nicely to hide the alcohol. The final tapas I ordered was piquillos al fuego. Even as a vegetarian option, this was absolutely divine. These piquillos peppers were stuffed with a blend of cheeses and chopped portobello mushrooms, lemon, and chickpeas. 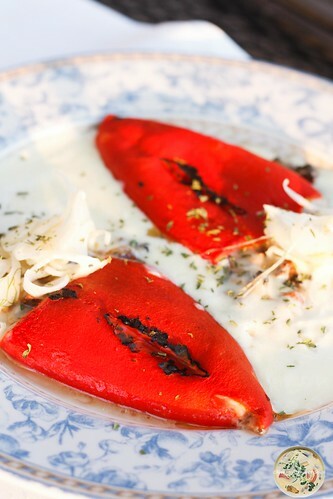 As an accent, they were topped with fennel and a roasted garlic cream sauce. I had thought the bread with gambas a pil-pil was filling. The piquillos al fuego helped induce a desire for sleep and I was okay with that. Per my server’s recommendation, I ordered pastel de chocolate for a postre. Being a few notches close to sated, this decadent cake put me over the top. 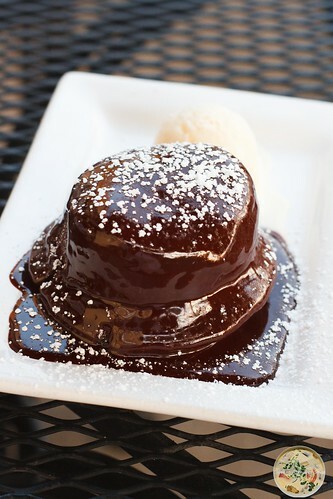 Served with a small scoop of vanilla ice cream, I didn’t think that something so small could be so incredibly rich. And when I say that it took me over 30 minutes to finish it, it was because I didn’t want to have any regrets about leaving any before departing the restaurant. Azucar recently celebrated nine years in spring, 2016. Just across the street from the Logan Square Blue Line and between El Cid immediately next door and a very short walking distance from Longman & Eagle, it’s in a prime location where there is plenty foot traffic. The menu is not extensive, which is very good for narrowing down selections, and the food is full of flavour. It took me eight years to walk the few short blocks from my condo to Azucar. It won’t take eight more years. That’s a guarantee.